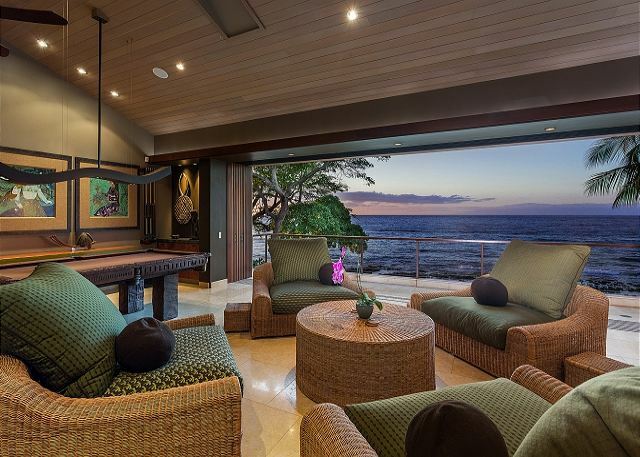 Located on the pristine and perennially sunny shores of Puako, a quaint oceanfront community on the Big Island's Kohala Coast, Pili Pono is a newly completed 5,384 sq. ft. waterfront home which offers a truly private and luxurious experience. The gourmet kitchen boasts all Miele appliances, granite countertops, and is complete with a built-in-convection oven, latter/espresso maker, range top, steam cooker, microwave, trash compactor and dishwasher. And if you'd rather watch someone else work his or her magic on your behalf, let us coordinate a private chef to prepare for you a culinary masterpiece. 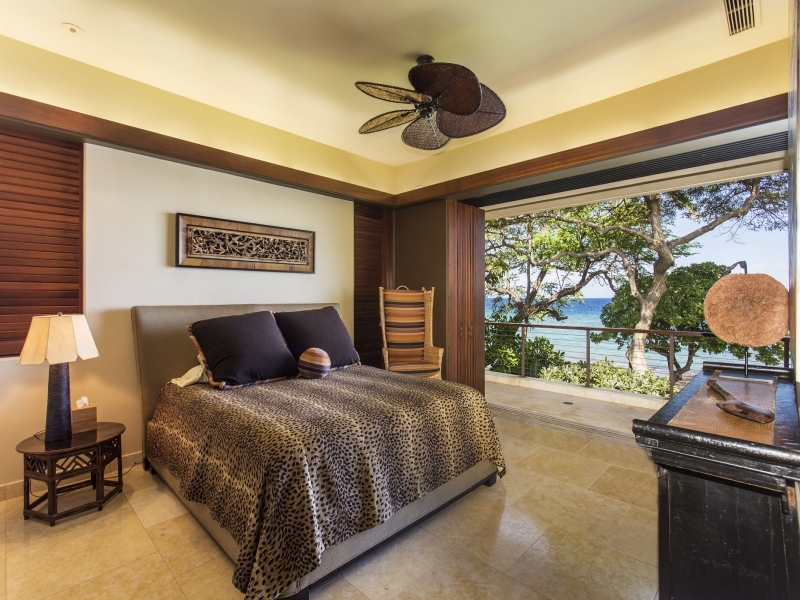 Three of the four bedrooms are suites with king beds and private bathrooms featuring indoor/outdoor marble lined showers. 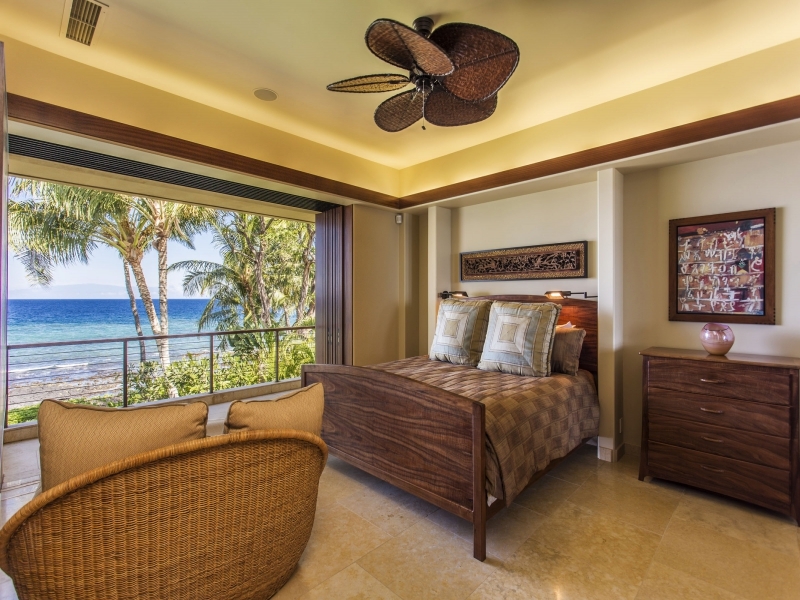 The fourth bedroom, a perfect nest for the keiki (children), hosts two mahogany bunk beds and comfortable seating around a big screen HDTV. 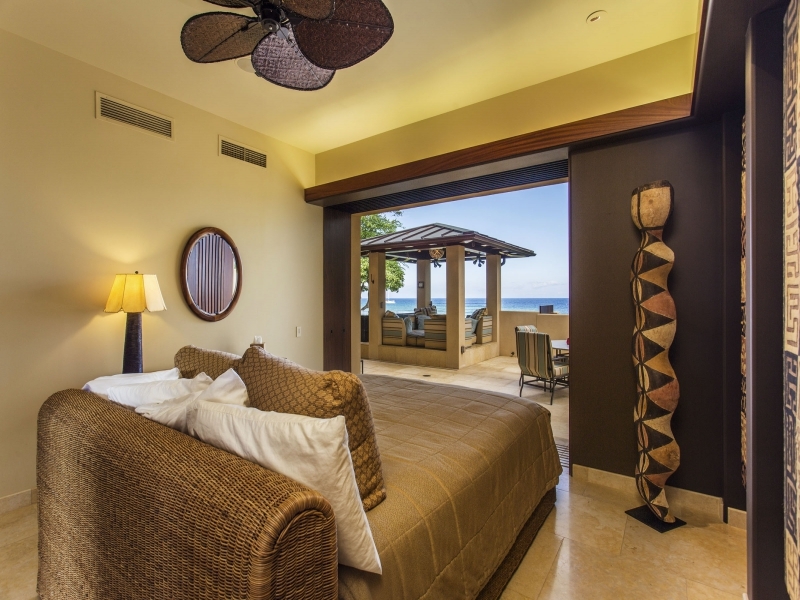 All rooms are equipped A/C and feature gorgeous ocean views with opportunities to witness beautiful evening sunsets. After a day of fun in the sun, relax in one of several recreational areas. 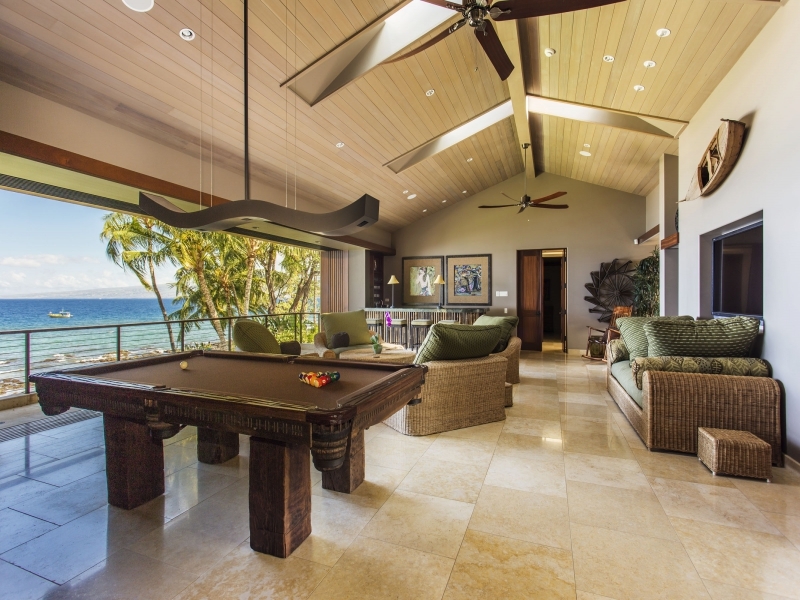 The upstairs living room features a pool table, a wet bar, a large HDTV with surrounding seating and huge pocket doors that open to the exterior lanais that offer more epic ocean views. 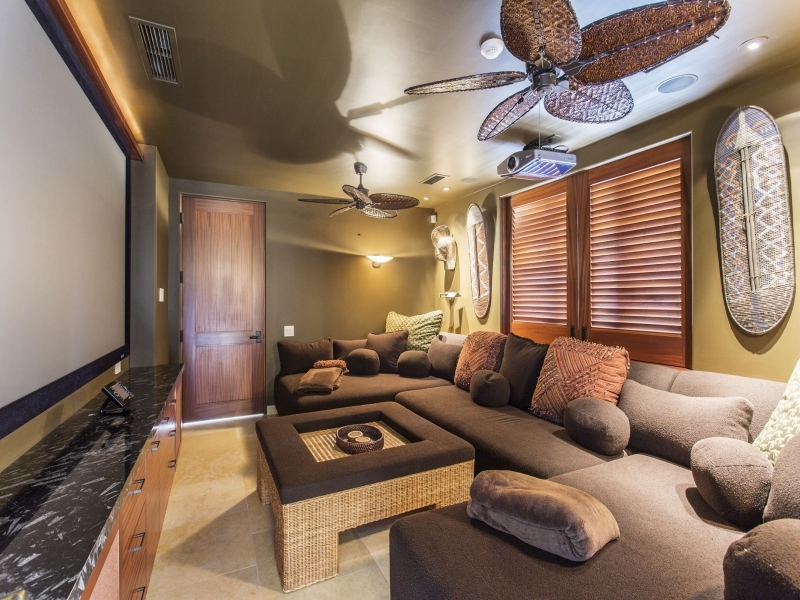 The air conditioned media room hosts a digital home theatre system with a wall size HD projector screen and DVD player. 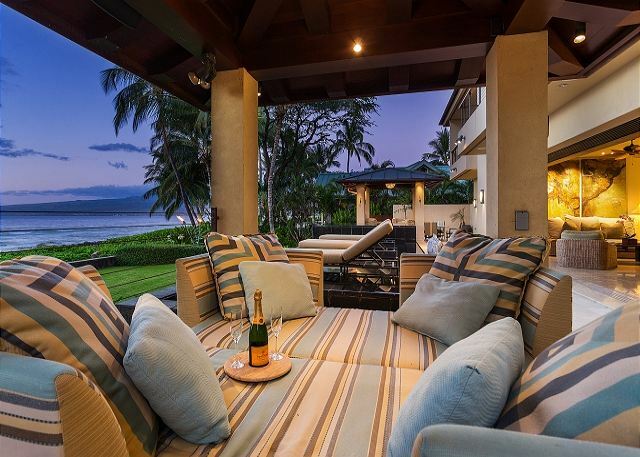 The outdoor perks at Pili Pono are boundless. 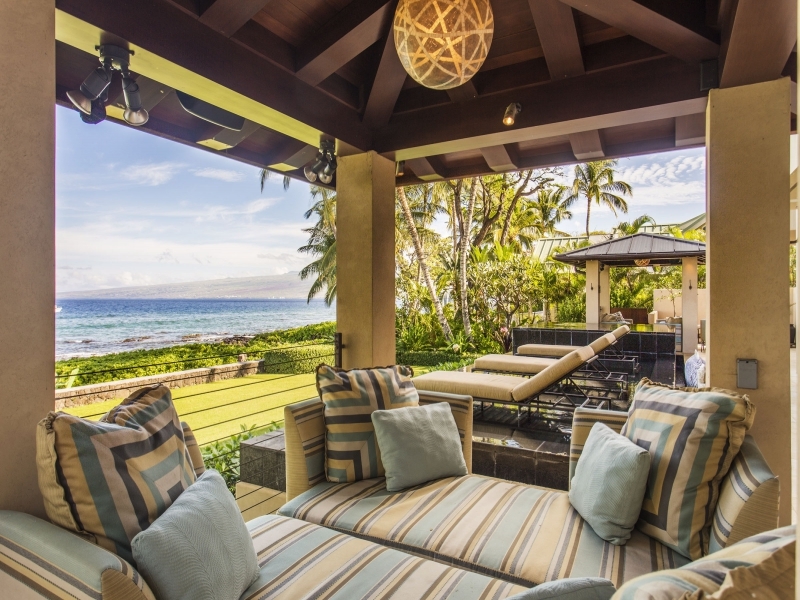 Fit for outdoor lounging, there are two fabulous gazebos with daybeds on the lanai. 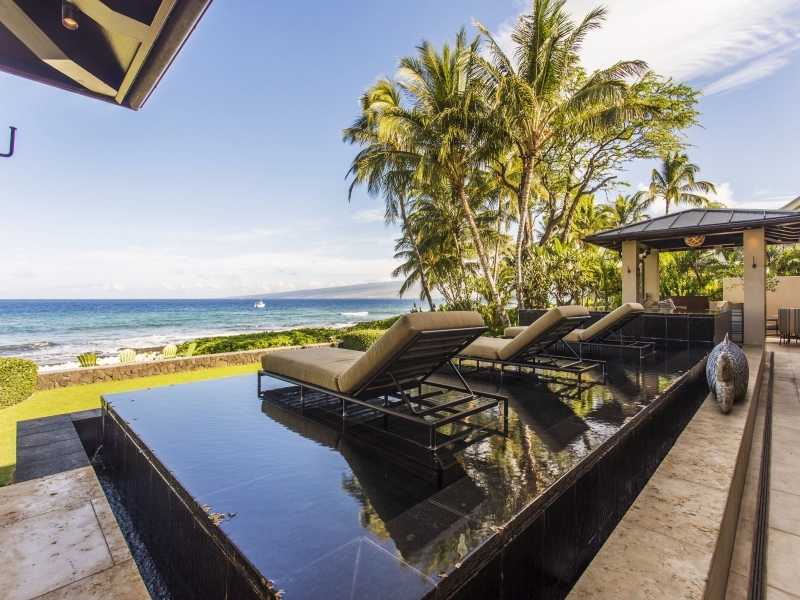 The ocean front yard offers a shallow dipping pool for warm afternoons and a large hot tub for cool nights. With the water's edge right outside your door, snorkeling is as simple as making the decision to meander the 150 feet down to the shore. The waters around Puako are extremely clear and ideal for underwater visibility. 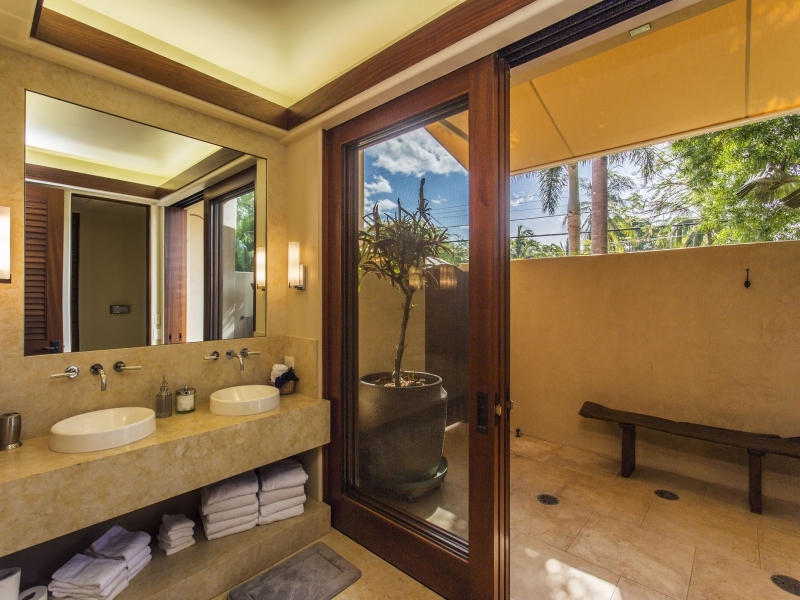 Be sure to rinse off in the heated outdoor shower upon your return from your swim. Parties and Events: We do not allow weddings or events at this property. However, guests are welcome to invite friends to enjoy this beautiful property, however the limit is 10 guests and the maximum guest count cannot exceed 20 people at any one time. We constantly work towards guest satisfaction ! We greatly appreciate your review as well. Amazing house and location! We have 8 of us, 4 adults and 4 teenagers. We did not want to leave the house. Snorkeling right at the door, whales, dolphins and turtles! Hapuna beach 1 mile away, was just perfect. Kyle was a gracious host and responded to any questions right away! If you can, stay at this beautiful and amazing house, you will not be disappointed. I am so happy to hear that you had a wonderful stay! We greatly appreciate your review as well. WOW experience from my 2 daughters, husbands, and my 5 grand kids. Pictures you see are on point! We took advantage of every view, activity, and Nikki's recommendations. Quality all around. Kitchens have all the toys! 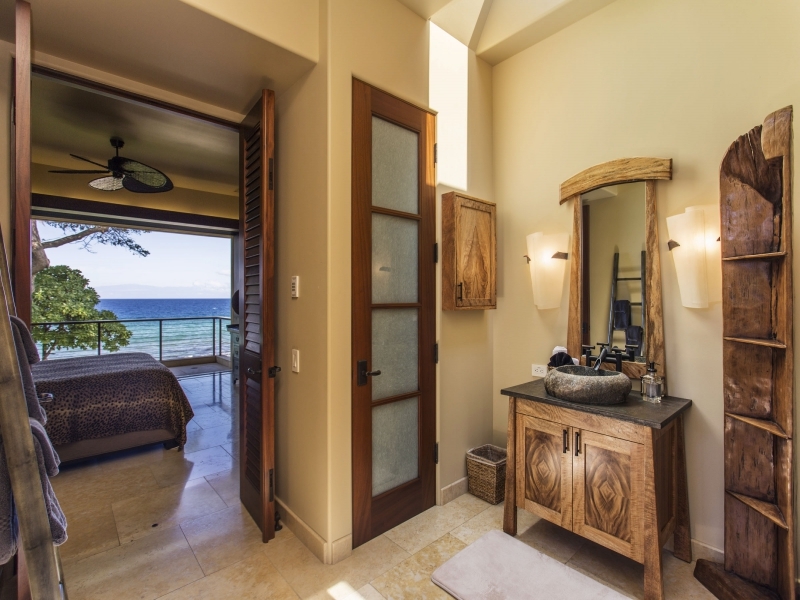 Bedrooms with optional outside showers o refreshing. Such a joy seeing my grandsons 6',6'1", 6'2", "6"3" enjoy their bunk beds like they were little boys again. Rented paddle boards and kayaks for the week and I watched from the "Spool"as they enjoyed. The scuba diving enjoyed by everyone right in front!! Mauna Kea Hotel Luau a must...2 grandsons were stars on stage. Monstera Noodles & Sushi amazing with a list of Sake like I've never seen. Saturday's Farmers Mkt so cool. Biggie for me was 5 minute walk to little Market for best ice cream ever or wine.. 5 minutes other way to charming Catholic church where the Priest walks in barefoot! my 12 yr old grand daughter on crutches and spent most of her time in the Spool with everyone else...oh and music speakers in every room...3 kids in college, if they knew their schedules now I'd re-book immediately...but will definitely re-visit this private paradise...Thank you, Nikki, for your welcoming hospitality. I am so happy to hear that you had a wonderful stay! We look forward to having you as a return guest. We greatly appreciate your review as well. The location of Pili Pono is fantastic! It is right on the ocean with terrific snorkeling and sunsets. With over 5,000 sq. ft, our three generations had plenty of space to be together as well as have alone time. The home is beautifully furnished and the outdoor area is fantastic! We barbecued and ate every dinner there. (Why go to a restaurant when we were at a perfect setting!!) Niki, the manager, was so very helpful with all of our questions and concerns. We cannot recommend more highly this beautiful home and setting!!! I am so happy to hear that you had a wonderful stay! We constantly work towards guest satisfaction, and we greatly appreciate your review as well. This was our 4th time staying at this magical home. The home is beautiful and the location can't be beat. The property manager, Nicki, is so helpful and responsive. The only issue we had on this visit was that the air conditioning was broken in 2 of the 4 bedrooms when we arrived which made sleeping a little uncomfortable for our guests. The only thing that could make this rental better would be having kayaks and SUPS included on property. I highly recommend this property! Aloha! Thank you for your review and recommendation! It’s wonderful to have you back for a 4th visit! We do apologize the air conditioning was broken in two of the bedrooms causing some discomfort, but we are glad to know Nicki was available and responsive during your stay. We appreciate your suggestion of upgrading this home with kayaks and SUPs for guest use, we can definitely look into this idea! Mahalo for being such pleasant guests and we look forward to seeing you again on your next visit! Wonderful stay at a beautiful location. Saw whales, dolphins, turtles and many fish. Ideally located between resorts and restaurants. I am so happy to hear that you had a wonderful stay! 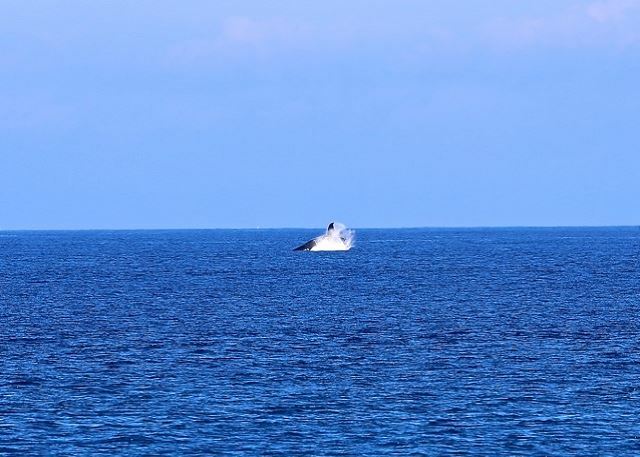 So wonderful to watch the whales and turtles happy you got to see them during your trip. We greatly appreciate your review as well. We were 5 adults and the house provided wonderful space for us all. It is very nicely laid out. It was more deluxe than we required - bar area, and media room, but was very, very comfortable. Access to the water was a bit challenging, but do-able. Aloha Sandra! We are so glad that Pili Pono was able to meet your needs. We agree that it is a wonderful home! Please think of us again on your next visit to Hawaii. We met for our small family reunion and the house met our every need. It was like staying at our own mini resort. Rooms were large and nicely appointed, location could not be beat with whales visible from the lounge chairs or jacuzzi, the amenities were top notch. The kitchen was fully stocked with pots and pans, the built in coffee maker was a hit with the adults! The TV room was a teenage boys dream with surf videos playing on the big screen daily and the view from the second story allowed us to watch sunsets while we played a round of pool. Puako is a special place on the Big Island, close to most everything on the Kona side but quiet enough to get away from the large resorts. So thankful to have had the opportunity to stay in this family friendly house that helped make great memories for my entire family. Mahalo!! Aloha, We are so happy to hear that you enjoyed your stay and the house met the needs of the whole family! It's great you were able to utilize the household amenities and create a memorable trip for everyone! Mahalo for the review and we look forward to hosting you and your family again in the near future! 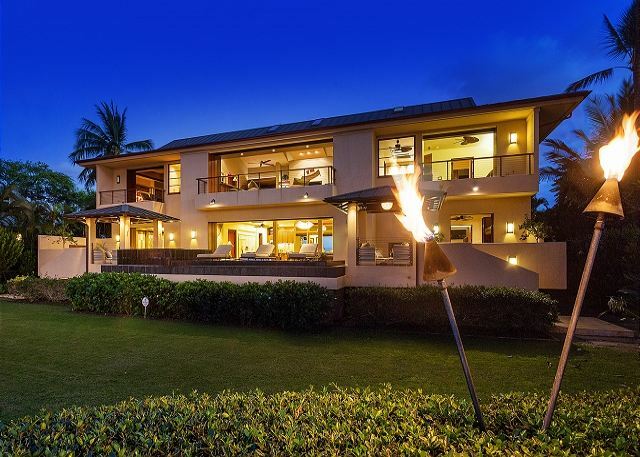 Puako is our favorite place to stay on the Big Island and Pili Pono was fabulous! The property was very well maintained and had everything we needed for our stay. Beautiful sunsets from the backyard. The two sets of washers and dryers made laundry time go quickly. We enjoyed kayaking and snorkeling out from the house. 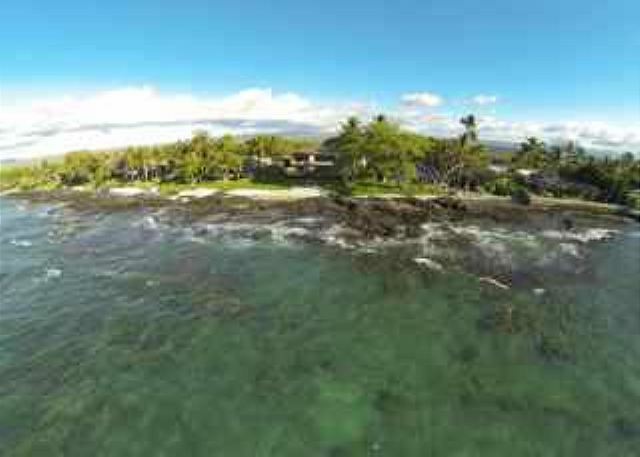 Great access from Puako to Waikaloa Village, Hapuna and Havi/North Kohala. Definitely a property we will enjoy again one day. We had a fantastic time at Pili Pono! The house was perfect for two families of four each and the location was convenient to everything we wanted to do. 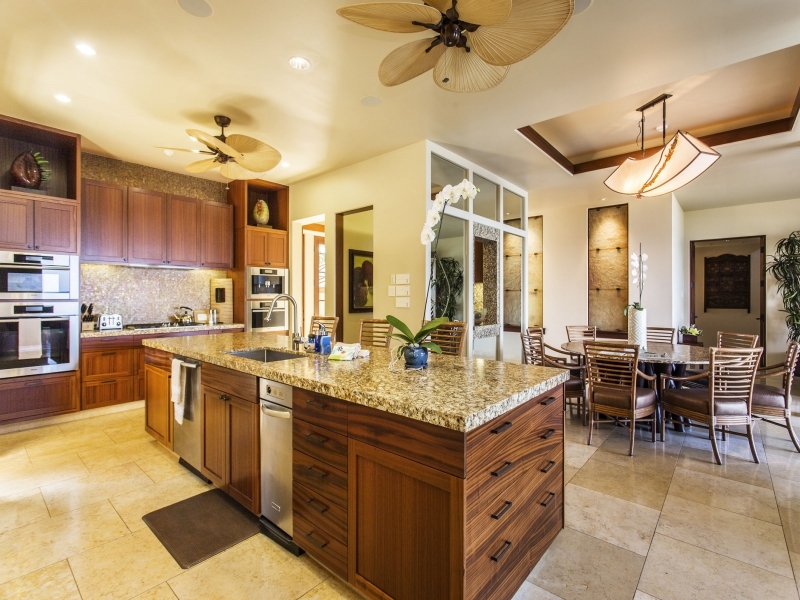 The house is completely stocked with everything you could want for a great stay on the Big Island. Look forward to coming back! Aloha! We are so happy to hear you had a fantastic time a Pili Pono and everyone in your group was comfortable! It sounds like you had everything you needed for a memorable stay and we hope you were able to make some lasting family memories together. Mahalo for being such pleasant guests, it was truly our pleasure to host you. Thank you for the excellent review and recommendation, we look forward to seeing you again on your next visit! Perfection on Puako Beach Road! The home was beautiful and perfectly stocked for 2 families. We could not have enjoyed ourselves more. Aloha! So happy to hear that everything was perfect for your two families! Mahalo for the great review and we look forward to seeing you again soon!